I’ve been in the business of investing in real estate and protecting real estate for over 30 years. Over the course of my career, I’ve seen the ups, the downs, the ins and the outs! I’ve learned a ton from hands-on experiences and from different mentors. Recently I was challenged by one of my mentors and best friends (Mike Stromsoe) to write a book to give to the community that I’ve served for so long. So, what can you learn from an insurance agency owner and real estate investor? Just 30 years of insider tips, tricks and secrets that have been boosting the income potential of landlords and apartment owners throughout California for years. My new book entitled, “Growing Your Real Estate Empire” is a useful guide to property owners growing their portfolio through long-term rental properties. In line with this, my insurance agency, Insurance by Castle (IBC) also offers our exclusive “7 Doors or More Protection Program” in California for those who own 7 or more rentals. This type of insurance offers superior coverage and more savings on residential landlord property insurance. My team at IBC knows when real estate investments are at stake, a good policy can make all the difference in the world. 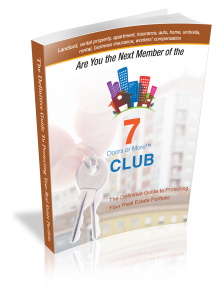 A hot offer right now is for residential landlords having at least 7 rentals to save on property insurance and still get premium coverage. “Come for the price. Stay for the service.” is the company slogan of Insurance By Castle. We advocate better and wider insurance coverage for residential landlords and apartment owners. Our role is to ensure that your independence is safeguarded by making sure that you are given access to the widest range of insurance providers, coverage, and pricing. I didn’t write this book with thoughts of becoming a world-renowned author but to simply help others. Along those lines, ALL proceeds from my book sales will be given to breast cancer awareness. Insurance By Castle specializes in residential (landlords and apartment owners) rental property insurance throughout the state of California. We also write personal and commercial policies. Among our top products is Home & Auto Insurance, Residential Landlords Insurance, Coverage for Businesses, and Life Insurance. We also offer some niche insurance policies. With 30 years experience in real estate investing and 30 years in running an insurance agency catering to residential landlords and apartment owners, you could say we know a thing or two about protecting real estate investments. Insurance By Castle is one of the leading residential landlords and apartment owners insurance providers throughout the state of California. We are partners with the best providers in America to ensure our customers have superior coverage. 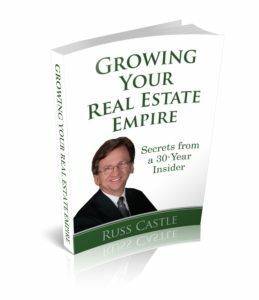 If you have questions about my book or about your real estate investments, give me a call at 800.644.6443 or email me at Russ@InsurancebyCastle.com.